It's Monday... you know what that means? It means it's time to post some indie polish to bring some cheer to the day! You may remember the TV Static manicure that I did with Windestine Carbon Copy and Windestine Asbestos. Well today I have two more Windestine polishes to show off! First up we have Spica. Spica is a crazy rich blue jelly with a bunch of different kinds of glitter in it. There are ton of sizes, shapes... the best part is there are CRESCENT MOONS IN IT! How cool is that? I used three coats for this photo. It applied nicely and the crescents seemed to come out pretty frequently with minimal fishing. Keep up with Windestine on Etsy and Facebook to stay on top of the shop restocks. Right now she is expecting to restock at the end of this month or the beginning of next month. I adore Spica it is soooo pretty! Loveee Spice... but it's a no buy month! 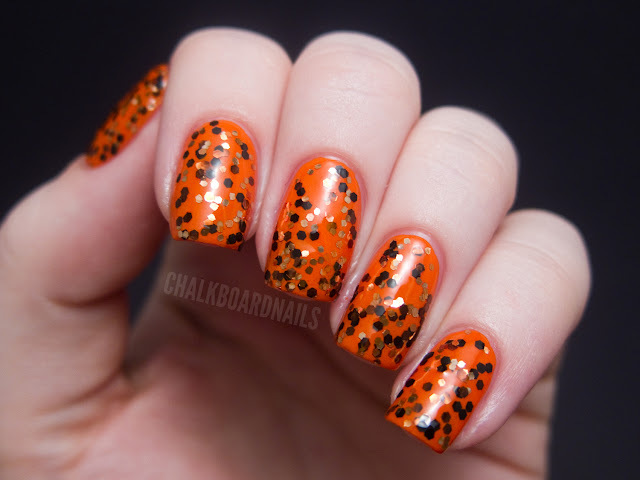 Into the wild over orange seems to mimetize leopard print, so nice! I love the crescent moons! Really love the blue Spica polish, looks so pretty! Oh wow, these are so amazing! Im glad that is not the case - and I love the photos - as usual! oh I love Spica.. those crescent kills!